John Garth ( 1721-1810) was born near Durham, in North East England. He started life as a jobbing musician, and made his career by promoting concerts in Durham every two weeks. In alternate weeks the concerts were organised in nearby Newcastle by Garth's good friend Charles Avison, in whose orchestra Garth played cello. He was an accomplished player, as shown by the quality of his six concertos, believed to be the first such pieces written by an English composer (considering Handel to be German.). 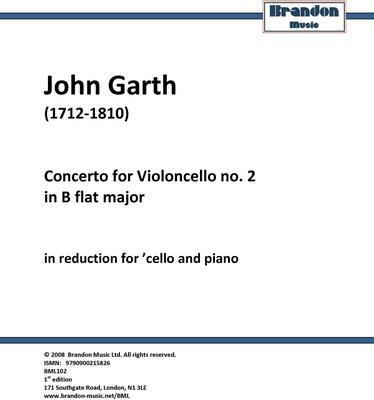 What do you want to know about John Garth - Concerto no. 2 in B flat major (Cello & Piano Arrangement)?